The WWVBS (Worldwide Vegan Bake Sale) is wrapping up this weekend so if you’ve been sitting around thinking about buying some sweet treats for a good cause, the time is now! 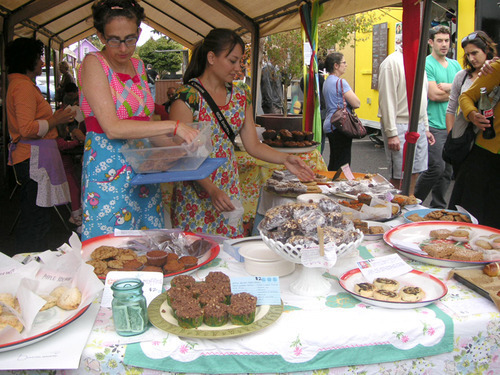 The WWVBS is a week of ad-hock bake sales all in the name of raising funds for social justice causes. Portland, OR will be holding their bake sale tomorrow Sunday 10am-3pm at the food carts at the Mississippi Marketplace (thats the food carts on Mississippi and Skidmore) 4233 N Mississippi Ave. Funds collected from the Portland Worldwide Vegan Bake Sale are going to Chimpanzee Sanctuary Northwest and Russia Freedom Fund (a group fighting for LGBT rights in Russia). Find out about all the other WWVBS events happening this weekend (and a few coming up the next weekend and the weekend after that, etc. So much for one week of events.) If you live in a major city chances are there is one happening near you! I wish we had something like this here in Seoul.